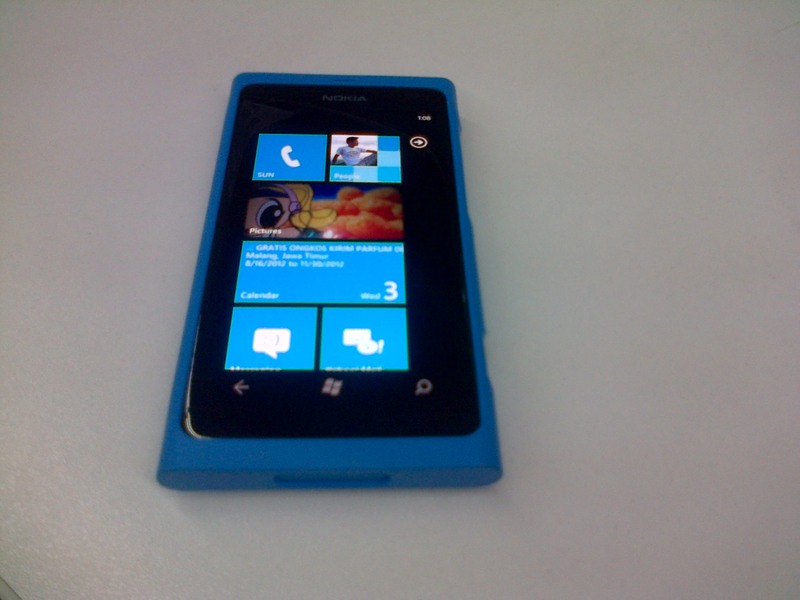 REVIEW: Nokia Lumia 800 Windows Phone | iStoryang HaaayTek! Finally, i got hold of one of the Nokia Lumia devices for a quite number of days–at least two weeks for a better grasp of its features. The production of the Lumia series was “outsourced to Compal Electronics which has the experience in the chipset”. The Lumia series is using the Windows Phone OS 7.5 Mango which is now outdated by the Windows Phone 8. The Lumias got its design from Nokia’s Meego-based, Nokia N9. The entire casing is made of a durable poly-carbonate material enabling its antenna to receive more radio signal than having a metallic casing. The antenna is located near the edge (right side if you’re facing the back of the phone). Visit Nokia Phils for the official specifications of Lumia 800. In this review, i’m using the specifications by gsmarena.com. The Lumia 800 is also known as Nokia Sea Ray. One of my regrets while reviewing the Lumia 800 is the poor 3G signal of Sun Cellular which i’d been using for more than two weeks of evaluating the unit. Most of the time i only got EDGE signal from Sun making it difficult for me to navigate the different apps installed on the Lumia 800. Another thing, i wasn’t able to make some screen shots of the various functions and features of the phone due to the absence of a screenshot feature which usually found in smartphones. Though, setting the display brightness to “automatic” would save your battery from draining early, it would be uncomfortable to others like me who’s no longer have a good eye sight. I always set the brightness to “high” to give myself a clear look at the screen. The AMOLED capacitive touchscreen of Lumia 800 is very responsive and i don’t see any hitches swiping it. The Loudspeaker in Lumia 800 is not as loud as we want. It can’t beat the decent sound i’d experienced from the Blackberry Curve 9320. It can’t even beat my MyPhone T23 Duo which uses a Yamaha amplifier. Lumia 800’s sound is too thin to hear and tinny for the ear. Even when you used the earphones you can really distinguish that its sound quality is below par to those other smartphones. Minus the device built-in usage, you have about 14Gb of storage remaining for your use as the Lumia 800 has no expansion slot for additional space. One BIG DISABILITY of the Windows phone is its restriction to use bluetooth in transferring files like images and music. You can’t pass any files directly to any bluetooth-enabled devices. Your runaround is to upload it online then download the files to your other devices. That’s too hassle! Windows Phone 7 supports some Bluetooth devices like phone headsets, car audio systems, and speaker docks but won’t let you send and receive items which are Object Push Profile such as contacts, pictures, and music over Bluetooth through mobile-to-mobile, or mobile-to-computer connections. The autofocus of the Lumia 800’s only camera works when you half-pressed the dedicated camera button. But i can’t share it here the pics that i shot in the absence of a Bluetooth functionality of the phone. However, the 8-megapixel camera is way below the quality of images taken by Sony Mobile Xperia phones that i have reviewed here. You can do Tab browsing in Lumia 800 with its fast browser. So, it can do multi-tasking by opening other apps or tabs at the same time. The live Tile menu has simplified the task in opening various apps and features including your favorite contacts. The Notification is just above the start screen which you can swipe sideways to open directly to it. If the message is from your favorite contacts included in the Tiles, a note on it is displayed. There’s no built-in Facebook and Twitter buttons on Lumia 800. You have to download it from the Market Place. One thing not really outstanding is the Facebook App (also develop by Microsoft). You can’t choose the album where the uploaded picture should be placed. Choosing a friend to tag with is not easy since you have to scroll the entire contact list before reaching the name you’re looking. There’s no shortcut for it. The App List is easy to use since the items are listed alphabetically. You can Pin to Start Menu the items so that you can access it at the Start Menu in a Tile. In the second image above, apps like the Connectivity Shortcuts, Facebook and Fim Chat are arranged accordingly. The Connectivity Shortcuts allows users to turn-on the connectivity features without going to the Setting and look for the Bluetooth, WiFi, and Cellular switches. The app can be added to the Tiles in the Start Menu. One good thing with Windows Phone software is its integration of the contact’s profiles in social networks. You can directly see the contact’s status and posts in Facebook right at the contact list as shown in the third pic above. The battery lasted only up to about 5 hours with 3G connection on and all other features are on even if the WiFi and Bluetooth functions are off. This is something that Nokia Lumia should improve since you’ll end up recharging your battery on midday and dinner time. The battery in Lumia 800 is built-in just like the iPhones. The mini-USB port is located at the top with a clip-on cover. Beside it is the SIM card tray which will pop-out once the USB port cover is open. The 35mm input jack for the earphones is also located at the top of the Lumia. makes this phone different from other smartphones. i own a lumia 800 nearly 5 mos now, and i beg to diasagree with your review.. if i could only show right infront of you how to properly use this awesome device i will be glad.. obviously, you don’t know lumia that much.. by the way, i am an iphone 3gs user bfore i switched, and my wife with iphone 4s.. so dont get me wrong cause what i actually can say where you are right is when u said photos on experia is better.. that i can attest, but tha’ts just it.. no more.. I know. But i’m referring to the Facebook app. You weren’t just used with Windows Phone.. Most of the Windows Phone Interface works in a swipe interface. Same BIG DISABILITY WITH iPhone. Directly from the photo??.. There’s a thing called Mobile Uploads in Facebook..
And if you wanna upload in a certain album. Use the Facebook App. Go to Your Profile>Photos>Select the Album you wanna upload your photo>Click the circle with a plus sign..
You can’t do that in the Facebook App for this particular phone. There’s no option to select the album where you have to upload the picture. You should have click the letters then choose the first letter corresponding to the person you wanna tag..
It’s not working on the Facebook App. Dude, next time, know the device first before you make a review. There are a lot of fault on your review. You cant even share the picture samples of the camera coz it doesnt have a Bluetooth file transfer? dont you know that you can use the usb and synch it to Zune? or just email it to yourself? And yet you have the guts to say that the Sony xperia has better shots than Lumia whereas you dont have any samples posted? You said that theres no integrated FB chat?? Oh cmon, dont you know that FB chat is integrated in the messages? RE: sound test, you didnt even perform a sound test to back up your feedback just like what gsmarena does. Dude, this is the worst review ever. I bet you know nothing about WP and Lumia. You just murdered this wonderful device. *In the 10th paragraph i emphasized the BIG DISABILITY of Windows phone to directly transfer files such as music and images using Bluetooth. I said you can upload it but it’s too hassle dude! *I stand by my review that the images of the Sony Xperia camera phones are better than the Lumia. *About the integrated chat feature, i am referring to the FB app that has no integrated chat. Try it for yourself. Yes, you are right the FB chat is integrated in the messages but you have to log in first to Windows Live. It makes the user experience difficult. *Sound test, i don’t have to present evidence because i am just telling my experience about the device’s sound quality. Purposely, i used the gsmarena’s specs here to give my readers more avenues to know more about the device. Thanks anyway for your feedback. I believe in the freedom of speech. Intriguing post – thank you. I thought your post was really intriguing. Thanks over again – I will come back.